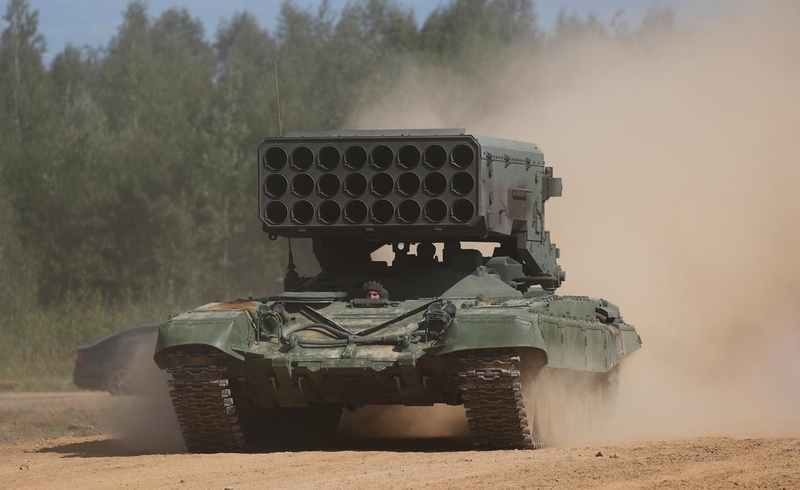 A Russian TOS-1A Solntsepek Multiple Rocket Launcher closing in with military column. 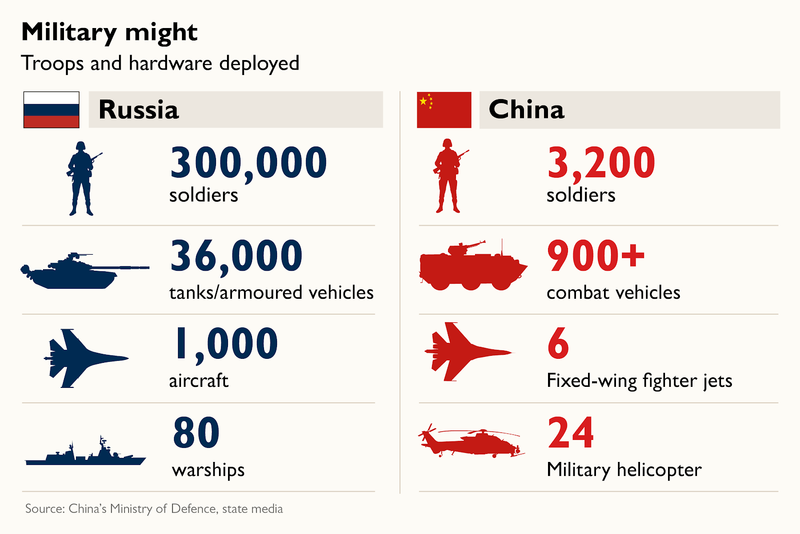 Russia launched a serious military preparedness on Tuesday what people called, the largest ever military drills, with hundreds of thousands of troops taking part along with Chinese soldiers in a show of force. NATO condemned and claim it as a rehearsal for "large-scale conflict." President Vladimir Putin is expected to attend the games speaking at the economic forum in Vladivostok where his Chinese counterpart Xi Jinping is one of the prominent guests. The week-long war games dubbed "Vostok-2018"(East-20) "have kicked off" in far eastern part of Russian territory, the defence ministry said. Numbers of soldiers taking part in the drills are around 300,000 soldiers plus 36,000 military vehicles, 80 ships, 1,000 aircraft, helicopters and drones. Some 3,500 Chinese troops from the Red Army have also taken part in the games. The defence ministry released video footage of military vehicles, warplanes, helicopters and ships getting into position for the initial stage of the drills. Beijing and Moscow have developed a "strategic partnership" reflecting their shared common front and opposition to the "unipolar world", the term they use to describe perceived U.S. global hegemony and aggression. The rapprochement has been driven by a strong personal relationship between Putin and Xi, seen as the most powerful Chinese leader since Mao Zedong. The two have met nearly 30 times, and Putin said that the Chinese president is the only world leader whom he once invited to celebrate his birthday. The drills, which also include Mongolian soldiers, have been condemned by NATO that claiming the exercise as a rehearsal for "large-scale conflict". The military exercises come at a time of escalating tensions between Moscow and the West over accusations of Russian interference in western affairs and conflicts in Ukraine and Syria. The Russian army has compared the recent show of force to the USSR's 1981 war games that mobilized combatant soldiers between 100,000-150,000 during the "Zapad-81" (West-81) -- the largest military exercises of the Soviet era under Warsaw Pact. Russian Defence Minister Sergei Shoigu said these exercises are even larger. "Imagine 36,000 military vehicles moving at the same time: tanks, armoured personnel carriers, infantry fighting vehicles -- and all of this, of course, in conditions as close to a combat situation as possible," Shoigu said. The exercises will be held across nine training ranges and three seas: the Sea of Japan, the Bering Sea and the Sea of Okhotsk. In another separate event, Putin praised Russia's increasingly close ties with China as he met with his counterpart Xi at the Eastern Economic Forum in Vladivostok on Tuesday. 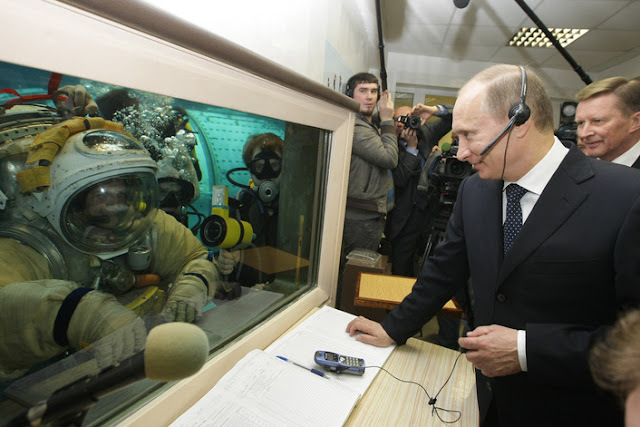 "We have trustworthy ties in political, security and defence spheres," the Russian leader said. Xi for his part said the two countries' "friendship is getting stronger all the time." 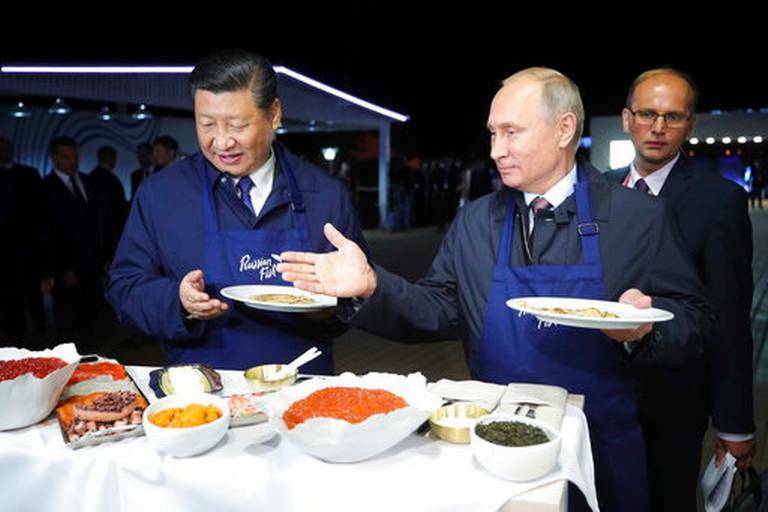 President Vladimir Putin has treated Chinese President Xi Jinping to Russian pancakes in a show of warm personal ties between the two leaders. The two leaders ate pancakes with caviar and had shots of vodka at an exhibition during the economic forum. The Russian army is rolling out all of its latest additions for the event: Iskander missiles that can carry nuclear warheads, T-80 and T-90 tanks and its recent Su-34 and Su-35 fighter planes. At sea, the Russian fleet is deploying several frigates equipped with Kalibr missiles that have been used in Syria. On Wednesday the games will feature anti-aircraft technology, while the main event will be on Thursday, the defence ministry told journalists who covered the event in eastern Siberia. NATO said that Vostok-2018 "demonstrates Russia's focus on exercising large-scale conflict". "It fits into a pattern we have seen over some time -- a more assertive Russia, significantly increasing its defence budget and its military presence," the alliance's spokesman Dylan White said late August. Putin's spokesman Dmitry Peskov dismissed such concerns on Tuesday. "These are very important drills but they are part of routine annual work to develop the armed forces," he told journalists. Peskov has earlier said Russia's "ability to defend itself in the current international situation which is often aggressive and unfriendly to our country is justified, essential and without alternative"
Relations between Russia and the West declined sharply in 2014 with Moscow's annexation of Crimea and the uprising in eastern Ukraine. The Kremlin has noted NATO's expansion in Caucasus, Baltic and Arctic region threatening Russian national security. Moscow has increased the number of its large-scale military exercises in those areas like the Baltic region to counter western influence. Russia's previous military exercise in the region, Vostok-2014, was almost half the current size, with 155,000 soldiers participating. The country's war games in Eastern Europe last year, Zapad-2017, saw 12,700 troops take part, as according to Moscow.